Beauty offer company All Boxed Up offers beauty boxes at great prices. I was offered the chance to review the latest box which is full of full priced items. This beauty box has over £113 worth of products for only £19.99 including postage and package. You choose the box on their website so you see exactly what products you will receive and pay for before you get it. Perfect for me as I am not a fan of surprises. 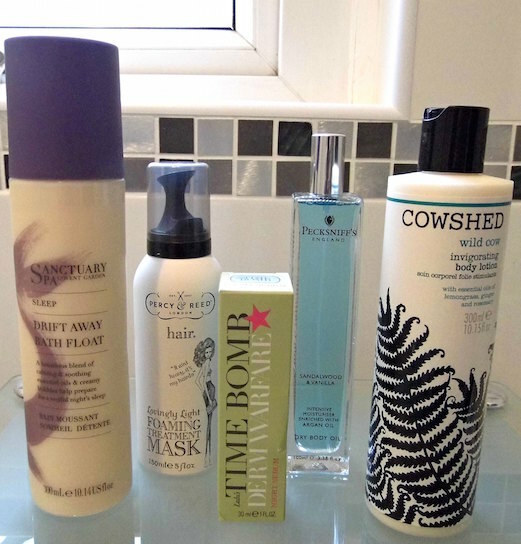 When the products arrived, in the New Year New You package, immediately I was struck with the big beauty names, especially Cowshed and Sanctuary Spa. 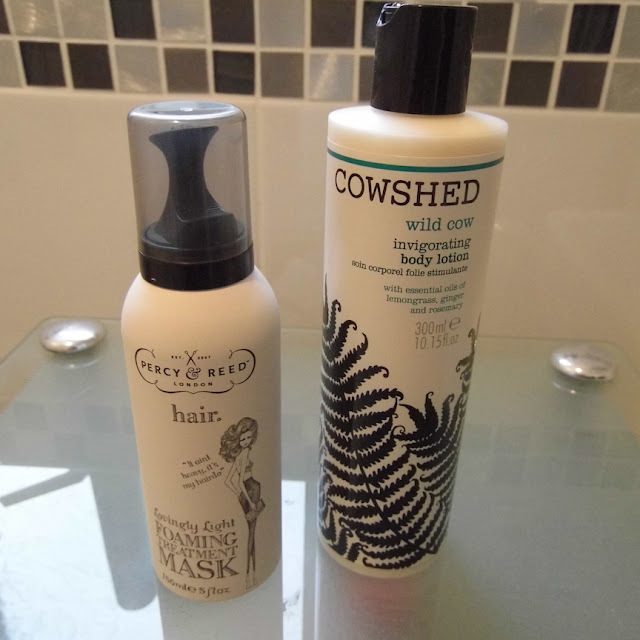 I am a big fan of Cowshed products, and I remember the time I stayed at the Dean Street Townhouse where they used Cowshed products in their bathroom. I was very impressed with this, especially when I smelt how wonderful they are! So let me tell you about this beauty box. Firstly when the products arrive they come in a no nonsense cardboard box. This is to keep the cost down and pass on all the savings to you, the buyer. Most if not all of the products on the website are full sized products. This is certainly different to other beauty boxes I have seen in the past, and a welcome perk. This box contained the following items below. Now let's start with the Percy and Reed Lovingly Foaming Treatment Mask. This is a foaming mask that you apply like a mousse to freshly washed hair. You comb it in and leave it for between 2 to 5 minutes, then rinse. It is formulated for fine flat and dry hair. My hair is fine and flat and dry on the ends so I was excited to try it. I have to admit I was disappointed. I applied it to my hair but not my roots, but it just made my hair look greasy. One good thing is that it didn't weigh the hair down, however I didn't feel it conditioned it either. Now every person's hair is different so it could work for your hair but this product wasn't for me. The Cowshed Wild Invigorating Body Lotion is packed with essential oils to wake you up, invigorate and moisturise. With essential oils of lemongrass, ginger and rosemary it had a warm smell, that was long lasting. In one way it reminded me of the smell of a really lovely spicy Thai dish. It is certainly a smell that will wake you up in the morning and the added benefit of Cowshed products is that they contain no parabens, petrochemicals, sulphates or artificial colours and are suitable for vegetarians too. Sanctuary Spa are a well known brand that offers a range of skin and body products based on what they use in their Covent Garden spa. The products are mid range luxury products but I feel at an affordable price. This gentle smelling Sanctuary Spa Luxury Bath Float left a lingering smell on the skin. Especially formulated to make you sleep the fragrance is made of Ylang Ylang, Frankincense, and Patchouli. I was pleasantly pleased that this didn't smell overpowering. Add to running water, and the bubbles will help you relax and reduce tension and stress. A very nice bath product that I can see would certainly help you to relax. Almost all relaxing products these days seem to have lavender in and I can categorically say there is no lavender here! 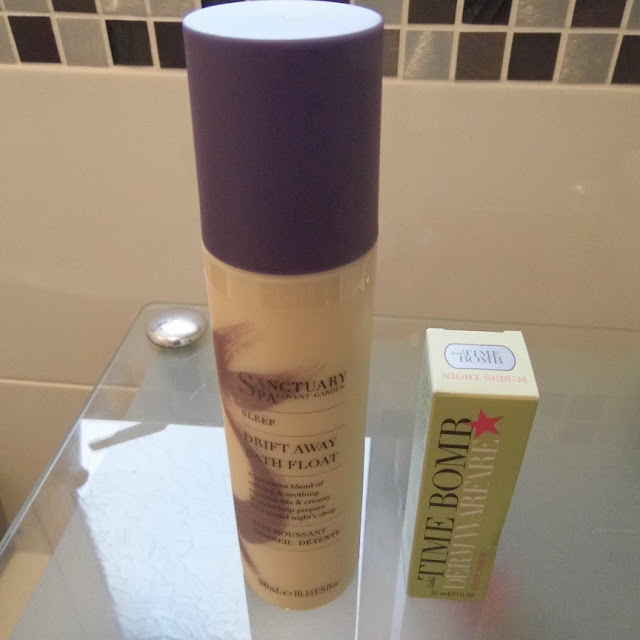 The Timebomb Derm Warfare night serum is a brand I hadn't heard of before but when I realised that the company's brand ambassador is Lulu then I was eager to try it, after all she has the most amazing skin, don't you think? This product is priced at £33 normally so a definite luxury product. You apply this product at night to clean skin avoiding the eye area and it helps to make your skin radiate by removing dead skin cells. The product has a very slight tingle when applied and I was concerned it may irritate my sensitive skin but it didn't at all. I am looking forward to seeing the effects of this product over the next month. The only thing I could say which is slightly negative is that I feel they could work on the fragrance or even make it fragrance free. 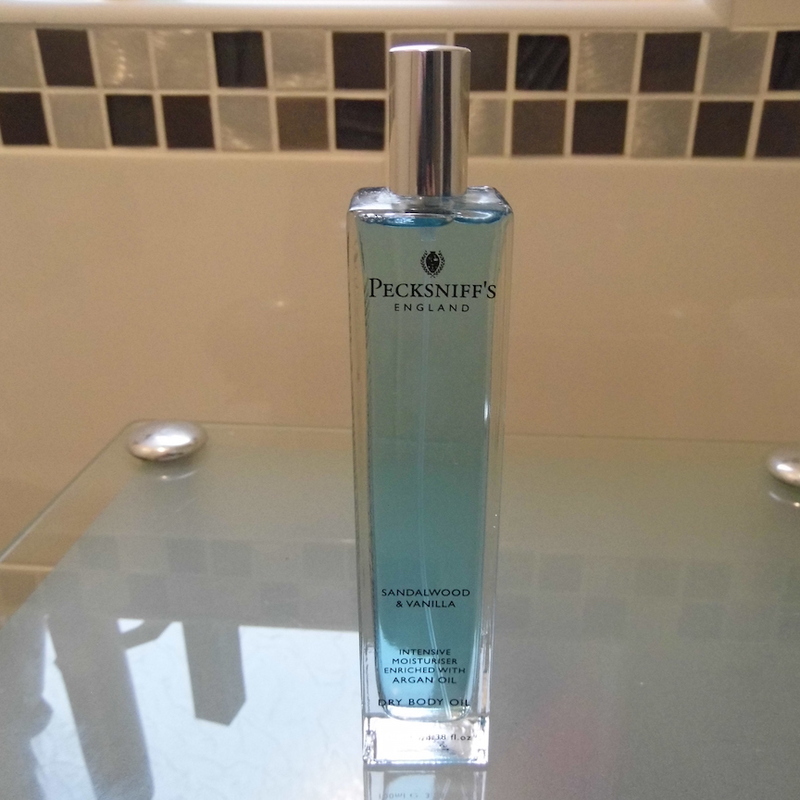 The Pecksniffs dry body oil is a product enriched with argan oil and smells of sandalwood and vanilla. I think it is a unisex fragrance that both men and women could use. Although it is a dry body oil, it certainly doesn't feel greasy on the skin and it absorbs well. I didn't feel it was a 'heavy duty' moisturising product, so it was perfect for my combination skin. As you can see this beauty box is excellent value for the price and perfect for adventurous beauty lovers everywhere. 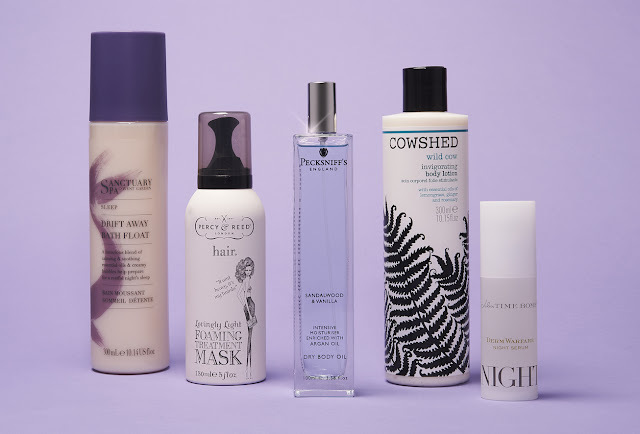 Even if you don't like all the products you will still save a huge amount of money on the recommended retail price of these items and you get to try new items and new brands too. If you don't like anything, you can always gift the item to a friend or relative. All offers are 'one offs' and once they are gone they are gone. I'm going to be checking this website every month for their new beauty boxes. In my opinion, this beauty box by All Boxed Up is highly recommended. omg Ive tried beauty boxes before, but I hate receiving samples! I didnt know any box offered all full size products. Thanks for sharing. Yes these are all full sized products! Yes, that's a unique selling point of these boxes and that you can see what you receive beforehand too. Products sound amazing. Would love to try them all. I'm honestly not a big fan of beauty boxes, as whenever I see posts about them there are usually only 1/2 products I am interested in. At least with this one you can see what products you are getting before you buy! Wow, they all sound great! I really need to try one of these boxes! I don't like the samples sizes you get normally but this box has full sized products. They all sound great, and what great value!